As I mentioned in the haiku, a swarm of meteors fall on Japan’s northern-most island, Hokkaido. One lands almost directly on top of Science Center Teacher/Technician/All-Around Girl Honami Midori (Miki Mizuno) and her brace of kids. Military personnel arrive the next day only to find the meteor gone, without so much as a note on the pillow. The military, commanded by Colonel Watarase (Toshiyuki Nagashima), scratch their collective heads in dismay. You think they might want to call a Scientist in on this? Then things get weird. Fast. Fiber optic cables vanish, spoo-ooky lights mar the sky, and 10,000 cases of perfectly good beer are senselessly destroyed, an intergalactic incident if ever I’ve seen one. The beings responsible for this alcohol abuse make their presence known by attacking a Sapporo subway train. Soon, a giant alien flower sprouts in the center of the city…and begins to go to seed. You don’t have to be Stephen Hawking to figure an alien invasion is underway, the plants and insects forming a gigantic, world-conquering symbiosis. Who could possibly save us? Soon, Gamera arrives, destroying the Space Flower with his usual skillz…only to be overwhelmed by the swarm of man-sized, armored insects. One character, remembering his Bible Study classes, christens the swarm Legion, and there you are. Gamera retreats to nurse his myriad wounds just as a Gamera-sized Mama Legion emerges from whatever underground lair the “little” ones ground out for her. The swarm instinctively turns south, towards (where else?) Tokyo. With that old clock a’ ticking, it’s up Watarase and Honami (along various hangers-on) struggle to understand the Legion, hoping to defeat these alien megafauna before they overrun the Earth. Settle in for ninety minutes of near-continuous action, city-smashing action being but one aspect of a whole. It’s as if someone actually put some serious thought into this whole “giant fire-breathing turtle” thing and decided to treat it with respect. Imagine. Many a giant monster aficionado has waited a long time for this. Improved special effects, and lessons learned from Guardian of the Universe, allow Gamera to become even more convincing than last time. But more importantly, Gamera 2 continues the trend of painting the Terrible Terrapin with just enough gray to make him both a hero and a monster. Once again, Gamera status in the Greater Scheme of Things (i.e., who’s side he’s really on) is explored, with the filmmakers consciously and constantly pushing this ever-narrowing genre’s envelope. Never before has a giant monster anti-hero undergone such a vicious thrashing…and certainly not for anything as lofty as “defending humanity.” Here, finally, we have a creature we can root for because (regardless of whatever the JDSF thinks) when giant monsters come stompin’, Gamera is our First, Last and Only Line of Defense. The usual military tactics fail miserably against Mama Legion leading to Gamera 2‘s real revolutionary scene, when the JDSF breaks down and supports the big turtle in his quest to rid the world of giant, glass-eating bugs. For once, I bought this shift in military policy (and I love how the commander makes it in the field…so much for “civilian control of the military” in an emergency ,right? ), having observed the military brass go through the entire arch, from disbelief to horror in the face of a giant monster threat, The very idea, and its brilliant eleventh hour execution, is as refreshing as a cold milkshake to the face, elevating the human elements of this story above the usual level of Exposition Delivery Systems. The Legion is even more refreshing, providing Gamera with an adversary that is both interesting and threatening. Better still, Legion is a challenge, something Godzilla’s enemies never seem to be. Our two hundred foot Hero sustains many a bloody wound before triumphing over his foe. 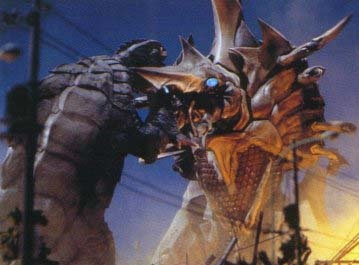 Forget the static, breath-weapon battles of the Heisei Godzilla-flicks: Gamera’s battles are kinetic and visceral grudge matches, much improved for the lack of rod-puppet Gaos. Gamera 2 is made all the better by its brisk, even pacing. Director Kaneko seems to know exactly what we monster-lovers crave and what we abhor with passion. Don’t expect any convoluted Personal Interest sub-plots to crop up amongst our human characters. Nothing kills a kaiju movie faster, anyway. What Honami and Watarase do on their days off is irrelevant to the proceedings. Why should we care when giant insects are about to take over the world? Not that the humans are unimportant…far from it. Their scientific inquiries and expository dialogue showcase the depth of thought screenwriter Kazunori Ito put into the Legion, it’s biology, and the overall arc of the film. Rather than farting around with their petty, personal problems, Gamera 2‘s human cast becomes intimately involved with the warring megafauna. Because they take them seriously, we in the audience can take the Legion (and Gamera) seriously enough to overlook the few bad FX shots. At for once, the humans are necessary to the plot, opening up the door to Gamera’s eventual victory. Of course this means some sacrifices have to be made…particularly in the area of character development. But so what? Instead of halting every ten minutes to ensure everyone has a proper Arc, Gamera 2 rolls right over you with a steady, drumming pace of the action films its so obviously meant to emulate. That’s head and shoulders above any movie released in the last year (or the last eight, for that matter). This film is an affirmation that, yes, giant monster movies can rock, and hard. It might just be the best giant monster movie to come out of the last decade. See also, Gamera 3.